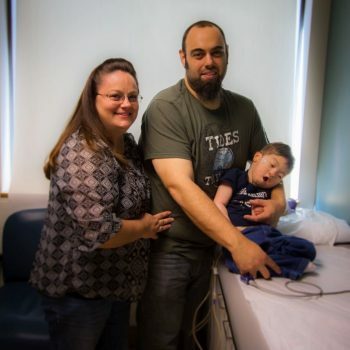 “Gavin was born with micrognathia, which is a small jaw, and had trouble breathing. So, at 3 weeks old, he was transferred to UCLA Health to have surgery,” says Deanna Steinrad, mother to now 2-year-old Gavin Steinrad, who came in for a visit with Dr. Marlyn Woo at UCLA Pediatric Pulmonology and Sleep Medicine. Gavin’s father, Loryn Steinrad, adds, “We’re indebted to so many of the doctors here.” Deanna agrees, “Gavin has ended up having more pulmonary, cardiac and endocrine issues. Every new person we encounter as a new specialist has treated both Gavin and us phenomenally. Everyone is overly friendly and they really have Gavin’s concern and well-being as their front-most priority."